These days when I walk into a Sanrio boutique store, I could always find something cute to buy. It still surprises me to this day that Sanrio has changed for the better since 2013. I believe it was sometime around after 2007 that I stopped entering their many Sanrio store locations here in the States. Maybe once or twice a year since then, I would visit one location to see if there were any interesting items to purchase. Usually with one glance around, I would quickly walk out empty handed. During those times, I was not interested in what they had been producing. All I saw back then was too much bright hot pink and low quality merchandise. Maybe all their focus at the time was intended for children under 4 years old. Most children under 4 would know no better because they can easily be entertained. I would hope a 9-12 year olds would start to attain higher standards than what was presented to them. 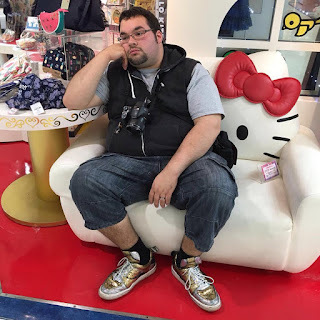 Whatever Sanrio USA was thinking back then, you couldn't tell the difference from the fake merchandise selling on the streets to the actual authentic merchandise in the official store locations. Their designs were that bad. Another disappointing fact that as the years went by, the other classic characters started to disappear one by one until all was left was Hello Kitty. 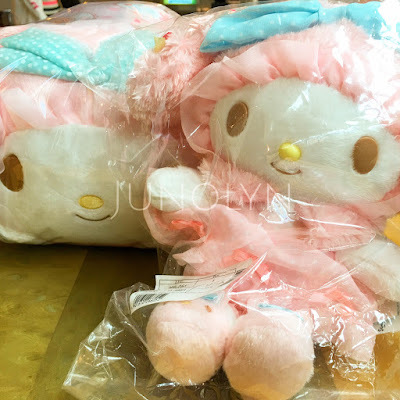 In 2013, I was trying to find a nearest store to purchase a red My Melody plush, but soon realized that I would have to purchase one from an independent Japanese agent. It seemed like back then, all the good stuff was in Asia. Things have changed since 2013. Now, there are different type of character merchandise available at hand to choose from. Presently, there are shelves of different characters like Pompompurin, My Melody and Little Twin Stars. Nowadays, my mood is different when I enter a Sanrio boutique store. The feeling of anticipation and excitement has returned. The Sanrio boutique comparison to a candy store feeling has returned, something that I thought would never feel again. For one thing, better quality designs have returned and different style concept merchandise has been introduced with many various collaborations. Lately, Sanrio seems to be back on track with better products, but it seems like there are certain areas that can be improved on. Sometimes, I feel like Sanrio can be better than what they are capable of now. I enter a boutique store and feel like the only things that I can buy are knick knacks and stationery, for the most part. Good clothing designs come and go. Plushes and figurines here and there, but no stylish decor to choose from. When I need to buy stylish or chic decor, I shop at Target or better quality stores. I'm not always looking for pink and cute plastic stuff. I am interested in stylish+cute+modern/vintage+chic+trendy designs all in one. Something that would capture my eye. Last year, Sanrio Japan seemed to start going on a different path because I bought some non-pink wooden desktop items. These were stylish and modern with a cute twist. I loved it. I do hope these boutique stores continue to add more changes like a side Sanrio cafe with comfy furnitures and more options for clothing, adult lounge area to relax and a small play area for kids. Maybe this vision is already in Japan. Whenever I drop by at the location in Japanese Village, I get the feeling that this boutique store represents the future for Sanrio USA. Inside at the back there is like an open area with the walls decorated in art. There are clothing racks that you rarely see in Sanrio stores at the Malls. The Arcadia and Topanga location have some clothing choices, but not like a big selection at Little Tokyo. I'm surprised that there are no gigantic statues or an impressive art display inside the Japanese Village location to attract photo ops. When I think of Sanrio boutique stores having a small cafe inside, I imagined it being filled with so much cuteness and the feeling of being transported from reality to a wonderland filled with dreams. If I could enter Willy Wonka and the Chocolate Factory, I would be in heaven. Who wouldn't be impressed at seeing a chocolate river, surrounded in edible candy flowers and edible landscape? But, I know that kind of wishful thinking will never be possible in our reality. Anyways, things that can be added to our reality are lounge areas for both kids and adults. Like this photo below from Instagram. Sometimes, a bored husband needs an area to crash for a bit while waiting for his wife to shop. Do you think some alpha males would ever want to step into a Sanrio store? I have a feeling that most guys out there would rather have their tooth pulled out than enter one. For the present time being, I will continue to have a big smile whenever I leave a Sanrio boutique store because I feel like I scored many more treasures. Jackpot!